For years I’ve coveted a Micheal Kors Hamilton Tote. I’d flipped the pages of magazines and sigh each time I past a picture of one of these gorgeous bags. However, I’m a fashionista on a budget and a $400 bag doesn’t fit into that budget very often so it seemed I would have to wait to hold my beloved bag. (I got bills to pay!!) Then, on Saturday January 21, 2012, that all changed. I had the day off and pondered that age old question: To shop or not to shop? I’m a shopping addict but spending a day doing nothing but relaxing at home is one of my favorite pastimes. Something was calling me though and (luckily) my addiction got the best of me and off to shop I went. I bounced around from store to store and picked up some pretty awesome finds: an adorable mod dress, a pair of grey wedges, brown heels for the upcoming warm weather, some new lingerie (another addiction of mine) and various other scores. 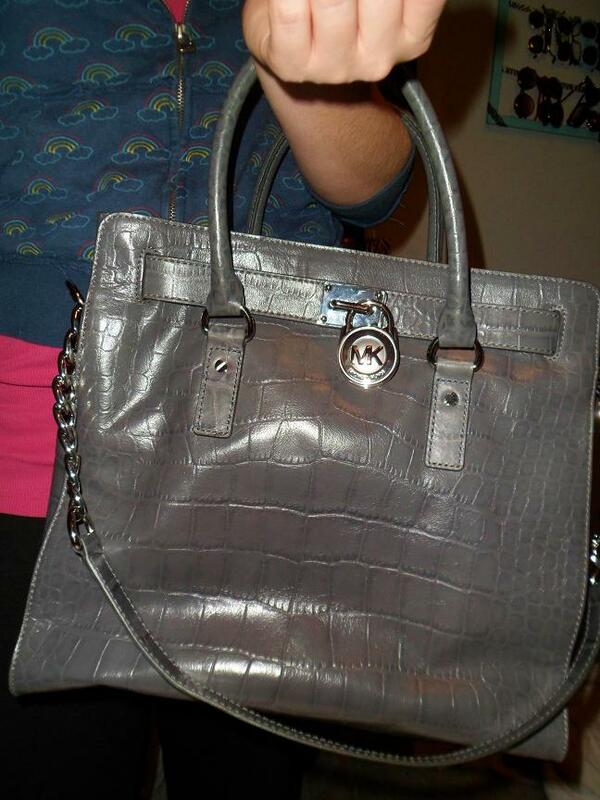 I was in Marshall’s when I spotted it: my slate grey Michael Kors Hamilton Tote for $200! I nearly fainted. I love Marshall’s and buy many a bags from there but never have I ever spotted such an amazing bag on their racks. Never. and I’m there a lot. Holding it just felt right but there was a dark cloud hovering over this blessed day. 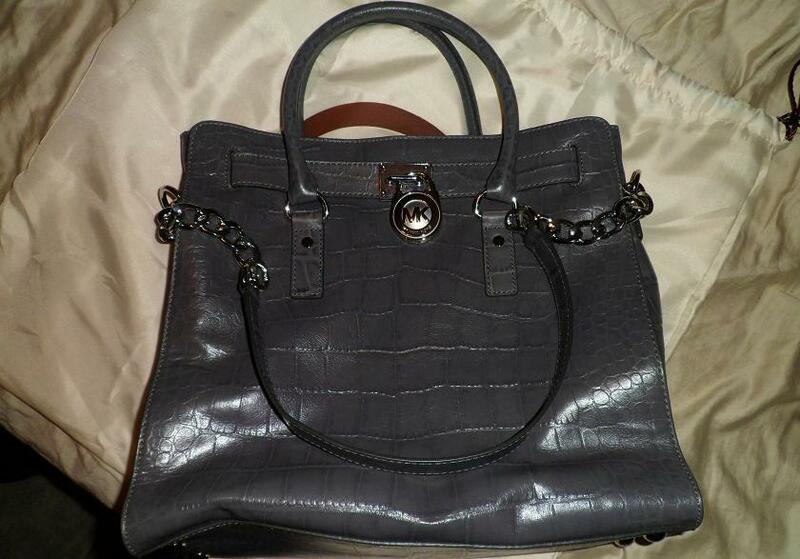 The Hamilton Tote was missing it’s signature Michael Kors lock and key! Sadly, I placed the bag back on the rack and continued with my shopping all the while dreaming of what could’ve been. It wasn’t until the next day, while out to lunch with my family that it dawned on me that this could still happen! I can’t let this slip away! I mustn’t let it! After discussing the bag with my mother, who agreed to let me use her as my own private layaway with immediate results (necessary because I had already spent my shopping money on all those other purchases), I called Marshalls and had an employee track down the bag and hold it for me until I could arrive to pick it up. Which I did immediately following lunch. I first asked the sales associates if they possibley had the missing pieces somewhere else in the store, they of course said “no.” However, I knew I could contact Michael Kors (or at least a member of his warehouse staff) for replacement hardware. You see, this was the realization that had brought me back to Marshall’s to purchase the bag anyway. I also knew I could get a few bucks knocked off of the price so I told the woman helping me that $200 was a lot for a broken bag, Michael Kors or not (*wink*). She asked if $180 would work but I kept at my game. She lowered the bag to $170 and I agreed to make my purchase (WINNING!). As soon as I left the store, I emailed the staff of Michael Kors and informed them of my “defective bag” and it’s missing hardware and asked what the procedure was for obtaining replacement pieces. Monday afternoon I had a reply asking for my shipping address. Halleluiah! I could hear the chorus of angels. All week I thought about how so soon me and my Hamilton tote would be complete! I didn’t expect, however, the staff at Michael Kors to act so quickly but on Saturday, January 28, a small brown package from Meadowlands Plaza, NJ arrived. It was my lock and key! I wripped open the package and immediately adorned my beloved tote with its proper accessories. Just one problem: The staff at Michael Kors failed to send me the leather piece that holds the key. That wasn’t going to bring me down though! I simply wrote them another email, thanking them for such prompt action, telling them how happy I was and requesting the missing leather piece. I’m now eagerly awaiting it’s arrival! … unless you’re a fashion genius like me. Let this be a lessen to all you budgeting babes: fashion miracles happen. I’ll brag about this bag and my amazing shopping skills for a long time to come! I’m sure you’ll spot this bag in many of my Daily Threads posts! I love how dramatic this is lol. p.s thats totally my old rainbow jacket. you’ve jacked it for so long I bet you forgot it was, or used to be, mine lmao!! Yeah. I did forget. Bc I never remember it being yours. I thought I got it from Marshall’s. Thanks! Lol it fits great! Hello I too am a shopaholic. Especially for handbags and shoes. I too purchased the luggage color Mk Hamilton tote without the lock and key and the leather holder. I called Mk and they said they only have the hard ware and not the leather hangtag piece I don’t know where else to find the piece. I did however receive the key and lock. I would like to complete the bag as it should be. I am very disappointed and am still trying to find the leather piece. I am just thinking about returning the bag. Unfortunately, no, they never sent the leather piece. I had contacted them again after receiving the lock and key about the leather piece and was told that that office did not have those parts available to send. I was going to eventually try and follow up again with their offices to find out who I could contact about that piece but never did. I also wanted to explore other avenues of obtaining that piece. However, having paid a fraction of the original price for my Hamilton, I’m not too worried about the leather piece. Ideally, I’d like to have it to complete the bag but I’m happy with it as is if I can’t aquire that piece. If you find out any information on how to get that leather piece I would certainly appreciate you passing it along to me! Thanks so much for reading! If I find a way to get that leather piece, I will be posting a follow-up, so check back! Hi there! Glad I’m not the only one who is obsessed and in love with their Michael Kors Hamilton bag! I wanted to let you know that Lord and Taylor’s and Macy’s might be able to help you. I bought my bag at Lord & Taylor’s for $160!!! They have a huge 40% off sale right now on designer bags, plus an addiional 20% if you use your Lord & Taylor’s charge card. I know it was a miracle and still cannot believe it, lol. You might be able to get the leather key holder there. Also, if you go to a Michael Kors outlet store they might be able to help. But if it was me, I would call them instead of emailing so you can get an immediate response. See if you could “buy” the key holder. Also, I was amazed that they key and lock actually works!! I wish it could lock the bag…not sure what purpose the lock serves unless you use it for something else, lol. Best of luck to you! Thanks, Aria! and thanks for reading! Enjoy that Hamilton! 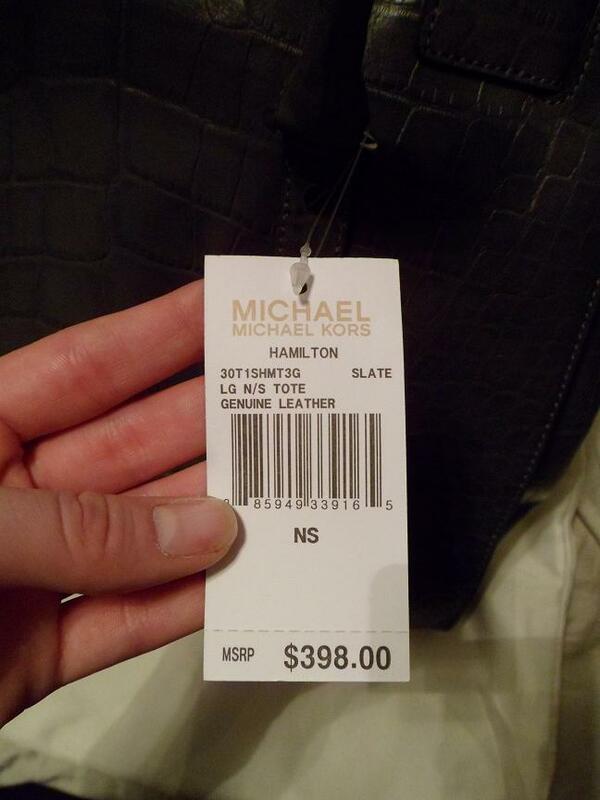 I’m in a similar situation I too got a deal on my MK Hamilton tote. I need a lock as well. Can you post the email address you requested the lock and key from? Thanks. Thats good to know! Thanks for the tip! and Thanks for reading!!! Omg, can you please give me the email address you used to contact MK? I too have a Hamilton and picked it up from the cleaners today. Not only did they ruin my beloved bag, they BROKE the lock!! I am beyond devasted and have been looking online all evening for a replacement lock and came across your story. I would be eternally grateful!! That’s horrid! I certainly hope you weren’t charged after such careless work! All the contact info is included on the warranty (& authentication) card that came with the bag when you bought it. Yes, unfortunately i pre-paid them. The only thing they are willing to do is contact Michael Kors for me and claim my bag was already damaged because they swear their machines would NEVER do this kind of damage. The upside is the hardware DOES exist. You’ve given me a little hope. Thank you for the reply!! OMG! I am so glad to how found your article! I no longer have my warranty / authentication card but would be eternally greatful if you could provide me the information you used. I have both the MK black Gosford with lots of gold bling and the MK black hamilton (missing gold lock & key). I would be so happy if I could come to a peaceful place like you. Glad you found your way to my blog, Jiji! No, I did not have to pay for the hardware replacements and I was never asked to show proof I my purchase. Like I wrote, I bought mine at Marshall’s. Marshalls, obviously is allowed to sell MK goods. I had all the original tags and my Marshalls receipt ready to scan and send as proof but I was never asked to. 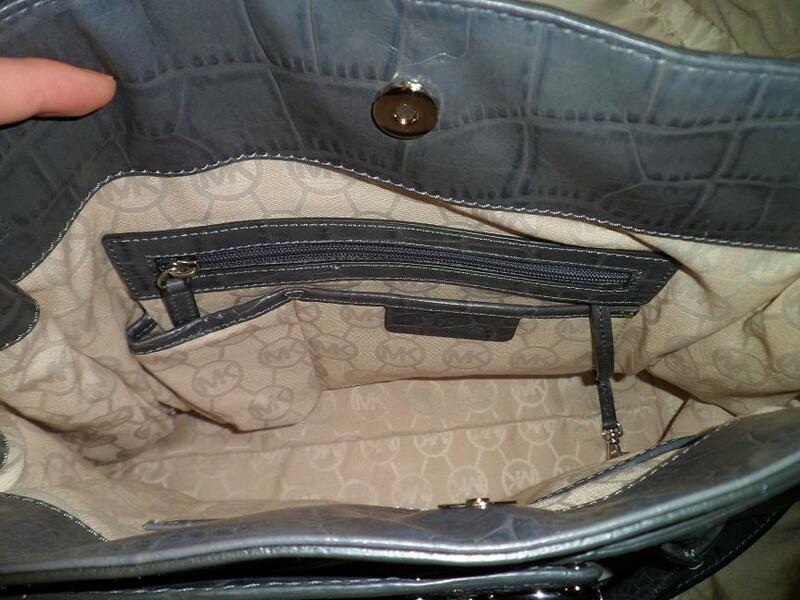 In researching this issue, I read that it is common for MK bags to be sold at the MK Outlet stores sans hardware. Many outlet shoppers request the pieces from the factory as well. I hate to point this out… But… Someone could possibly buy a “MK”esque bag… MK “inspired”… Faux… A knock-off and later request these authentic pieces to try and fool others. I think it’s lame, I’m not suggesting anyone do this, just saying that its possible. I suppose its also possible to request the pieces to sell on ebay to folks who haven’t read my post and found they could get them free. Although, I doubt they would extend this courtesy more than once. I realize the first paragraph adequately answered your questions, Jiji. I’m just in a rambling mood I guess. Cheers! Happy Holidays! and thanks for reading! Thanks for your detailed reply 😉 I appreciate it. I have a friend whose an ebay junkie and got me a Hamilton tote, but hardware is missing. I emailed MK and hope they come through. Now that Im inspecting, you think its possible to get gold hardware, although the strap/chain is silver(I can tuck that strap in bag). I dunno why but gold seems classier to me! Its black all around, only silver would be bottom pegs and the chain strap. Or is that just silly? The things we do to save $$…..
No problem! Thanks for the comment! 🙂 I don’t see why gold hardware wouldn’t be available; I would simply ask the associate who is able to help you. Hopefully you will hear something soon! I can’t remember 100% but I believe there were a few days that went by and I didn’t hear anything and then all of a sudden I got an email simply asking me for my shipping address. Hang in there. Good luck. and Thanks for reading/commenting! Let me know how things work out! The silver and gold will so clash! Urgh dunnno wat i was thinking! I emailed MK, and Ive received the lock and key (silver) if it wasnt for your Direction I would of been lost 😦 thank you!! I too am missing that leather tie. Ive been emailing back and forth with a “Mia” from MK and after she received my address hasnt replied to my other requests..maybe I was nagging but reply at least. Did you get the missing leather tie yet? Get a life! Don’t need a dissertation, just tell people how you got the lock. Geeeez! I read you story and I’m having the same problem. Can I get the Email address you use to contact Michael Kors customer service staff. Thanks! 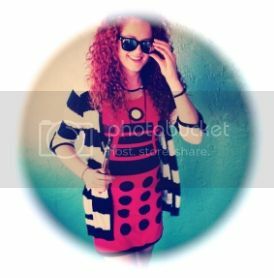 Please reply back as I’m wanting to create my own personal site and want to know where you got this from or just what the theme is named. Kudos! I had a similar Michael Kores experience! The bag I was gaga over was from an older collection and not carried anywhere! I found one on eBay! Even though it was a $400 bag I was able to snag it for $200, authentic still with tags on, never used and in perfect condition. May the fashionista goddess smile upon eBay. Amen. Did you mentioned where you purchased it? I purchased mine at TJ Max and im scared they wont send me a lock. D you still have the email address for Michael Kors? I just purchase a bag in the same condition on ebay for $79! No, I didn’t mention where I bought it but they didn’t ask or ask about anything else for that matter. I simply said I purchased the bag and it was missing hardware, they only asked for my shipping address and in about a week I had my lock and key!! Good luck, girlie! And thanks for reading!!! How much was the replacement lock and key?? No cost at all!!! Thanks for reading! hey….I just saw this bag at the outlet for $299 – but just couldn’t justify it…any chance you’re ready to part with it, and it’s still in good condition??? if so, email me: jenn_ha_@Hotmail.com Thanks!!! It’s in fabulous condition but I don’t think I’ll ever part with this bag!! Thanks for reading and keep your eyes peeled at Marshall’s & TJ Maxx, they get one or two in from time to time!! Love this story as I have just returned from TJ Maxx with the same beloved bag but in brown! It was love at first sight. And the $200 price tag blew me away. I noticed the missing lock as I headed to the check out and sadly returned it to the rack and continued my quest at the surrounding TJ Maxx and Marshalls. With an empty hand and a heavy heart, I returned home. But the next morning, I had the same realization you did, so I trucked across state lines to go back for the bag, and proudly brought it home. I’d been searching frantically online for a replacement lock (it has the key), when I found your story. 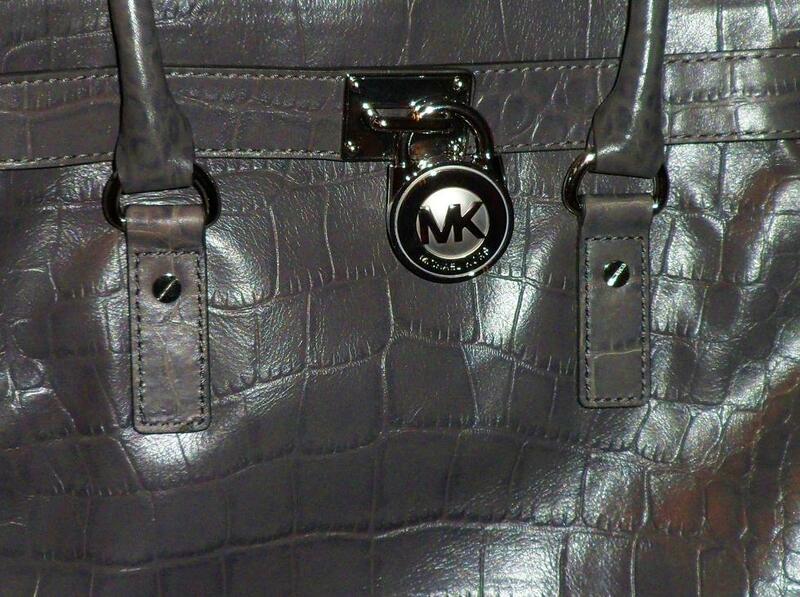 I will be contacting MK’s manufacturer ASAP, and cannot wait to have my handbag-dream come true, as well! Thank you! Yay!!! Thanks for sharing your story!! And congrats on the fabulous find!! Thanks for reading, I hope you’ll check back for new posts!!! No charge! Thanks for reading! Unfortunately, customer service for Michael Kors denied my request for the missing lock on my Hamilton tote because it was purchased at TJ Maxx. It’s a sad day for this fashionista. Thats a bummer! I was never asked where I made my purchase and I didn’t offer up the info either. I’m sure glad I didn’t now! Sorry about that. Maybe try contacting them again at a later time; perhaps another CS agent will be feeling more generous. I just got my second MK bag, I just love them. And, I have been looking for a third one in turqouise on ebay. Found one missing the lock, and was hesitant, but perhaps there is a chance I can replace it. It is definitely worth a try. Do you have a suggestion on where to contact them? Nice find! As mentioned above, the contact info I used was located on the Authentication Card included with my tote. Thanks for reading and for commenting! I WILL NO LONGER BE RESPONDING TO COMMENTS ON THIS POST. I am very pleased this post became as popular as it did although, I am not surprised. I have provided all the information I have/had on contacting MK customer service and obtaining a new lock and key. I wish all you bargain fashinistas good luck on any future must-have finds and any subsequent experience with customer services for any labels/brands. My mission is writing this post was to perpetuate the hope in fashion miracles! They do exist!!! I do not condone or encourage the purchase of knock-off bags or the acquisition of legit hardware to perpetuate a lie. Thanks for reading and all these amazing comments!! I’d still love to hear tales of other fashion miracles but I won’t be answering any further question about my experience. Thanks again! Did they charge you and if so how much? Hey I am having the Same problem! Who did you email? & what did you say?